What does a mother do who has raised her child, lives six hours from "home", decides not to go here and go there just to be going here and going there? One listens to music that pumps you up, types a blog post, works on the Black Folder Project Workshop details, prepares encouraging crafts for baby boomers and teenagers, dreams a new dream and realizes life is as good as you make it. So, the first thing you have to do is research. Doing research on preparing for death and realized that I had two books in my library about the subject. One was a book that I brought at a Library book sale years ago. The book is out of print now, but has some interesting information: How to Prepare for Death A Practical Guide by Yaffa Draznin. The other book I had just purchased from Amazon about a month ago (I had renewed it at the library for the max number of times) because I thought it was interesting enough to have in my library collection: Spiritual Passages Embracing Life's Sacred Journey Drew Leder, M.D., PH.D. I didn't know when I read and brought that book that many of the ideas in it would help me with the Black Folder Project, but that's how things work out. Also I found out by researching on line that you can get a certification in "Thanatology". Thanatology - the study of death, dying and bereavement. That's an interesting term. I also found a couple of documents/forms on line about all the things you need to pull together for preparing for your death. My spirit tells me to give people this information in the workshop so they can work on it at home after the workshop, but to FOCUS the Black Folder Project on the Final Farewell. Focus on giving people the opportunity to not have any regrets of not having expressed something to their loved ones. This will be about encouraging participants to write letters to loved ones that can be shared after they have passed on. That resonates more with me than the checklist of documents that you need in the folder. Of course people are going to say some of these documents belong in safe deposit box...go for it, but put copies of the docs in your black folder. In the middle of working on this blog post my neighbor rang the door bell. She had told me earlier in the week about a local gig that her band was having on Mother's Day at Birkdale Village. I usually try to support things that people tell me about and was considering going later on today. She came over to tell me that the mother of one of her band members had died earlier in the week and they would not be playing today. The more we talked about death and dying the more I felt led to tell her about the Black Folder Project. She loved the idea and told me she would help me with any contacts that she has locally. Also in talking with her, she told me about a book that she's working on about school administrators, she was a principal in NY, and that she wanted to get back to really working on her book. 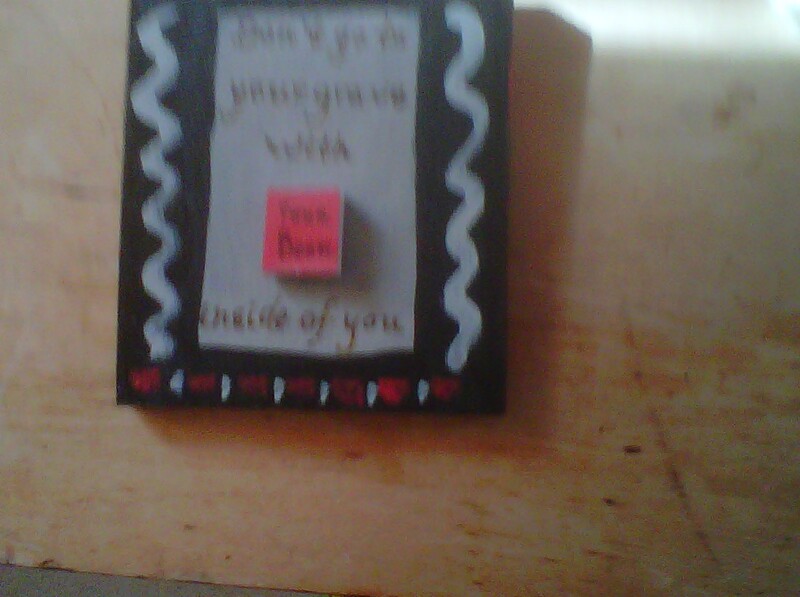 I knew that the small plaque that I had made about "Don't Go to Your Grave with Your Book Inside of You" was for her. (Below is a really bad picture because I quickly took it on my camera phone so I could remember the design). I gave her that as a reminder and it just made for the best Mother's Day for her and for me. Giving is receiving, always has been, always will be. Back to planning the workshop. So, the next song up on i-tunes was Joshua Bell's rendition of Eleanor Rigby. It was just the next song up on my iTunes songs list. The words and theme is interesting to me in light of the Black Folder Project. Many people live lonely lives. Even those with many people around them. They don't realize that their lives are important and that there is an intention for their existence. They are here for a purpose. Maybe they knew this purpose before they were born, and forgot it. It's hard to say, that's one of the mysteries of life. Maybe there will be those who will truly understand how important the rest of their lives are by going through the Black Folder Project workshop. Maybe it will help people get closer to finding their purpose. So, enough typing I need to go develop the workshop just like I would if it were a work assignment. Just do it. It's due today. So, off to planning a workshop.